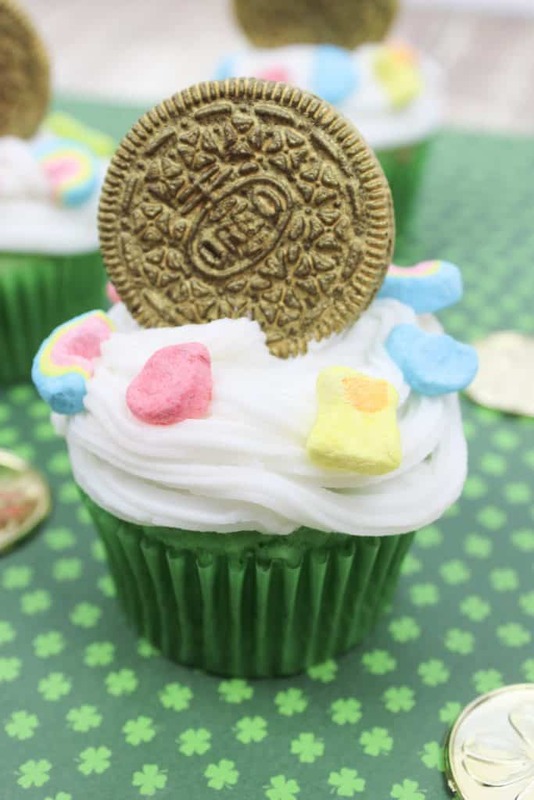 What better way to celebrate St. Patrick’s Day then with these adorable Lucky Charms Golden Oreo Cupcakes! 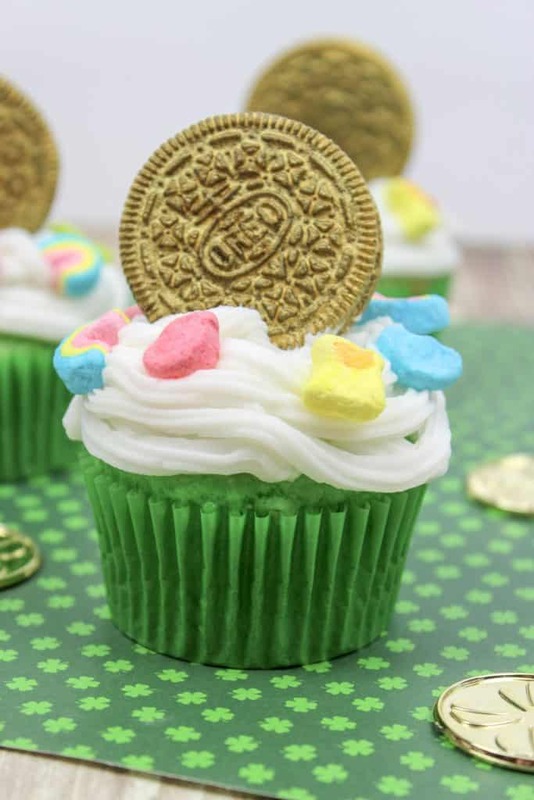 This St. Patrick’s Day, you can find the pot of gold at the end of the rainbow with these Lucky Charms Cupcakes. These adorable golden oreo dessert recipes are simple to make but so fun to give away. 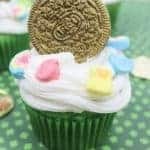 Your kids will love enjoying this St. Patrick’s Day cupcake or love taking it to their school friends for a holiday party. Other St. Patrick’s Day Party ideas include St. Patricks Day sight word bingo, pot of gold cookies, mint fudge and Mint Cookies. You’ll probably also love all of these really fun rainbow recipes! Prepare the cake mix according to directions. Add green food coloring and mix until the batter is completely green. Pour into the cupcake pan. Frost the top of the cupcakes with this Betty Crocker Cupcake Frosting or use regular white frosting. On a piece of parchment paper, lay down 12 Oreo cookies. Spray them with the Wilton Food Spray – make sure to cover both sides and let dry. 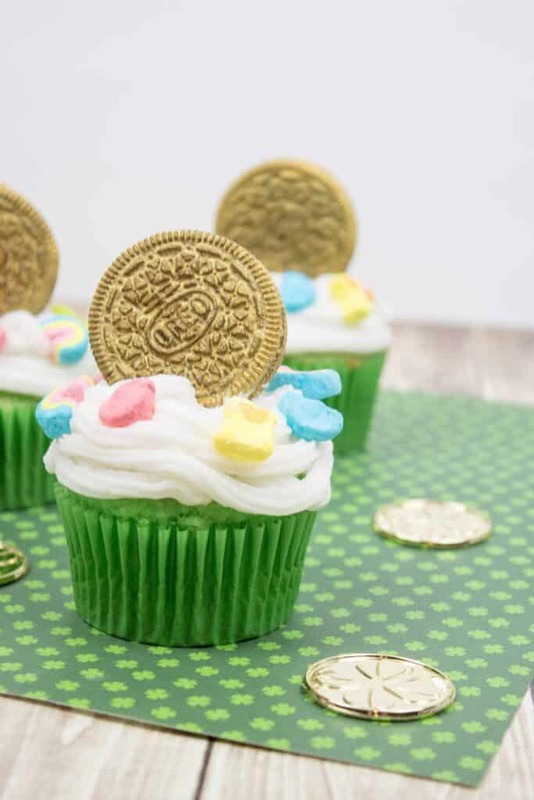 Place each Oreo on top of each cupcake to represent a gold coin. 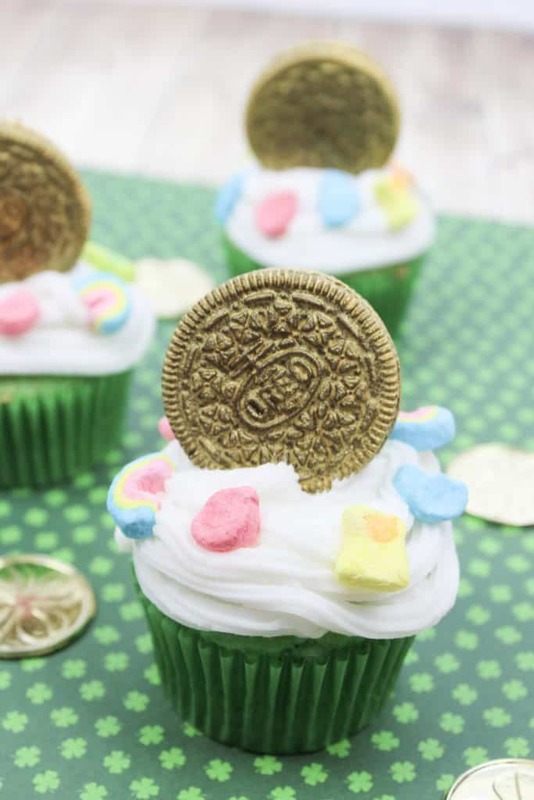 Place Lucky Charms marshmallows on top of the rest of the frosting. On a piece of parchment paper, lay down 12 Oreo cookies. Spray them with the Wilton Food Spray - make sure to cover both sides and let dry.